Hershey's Kisses are small bite sized portions of Hershey's famous milk chocolate. 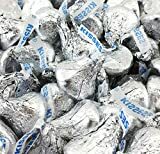 Each Kiss is about 4.46 grams or about 1/9 of a 43 gram Hershey's chocolate bar. Hershey's Kisses come in several variations and vary in caffeine content based on the amount of cacao they contain. Hershey's Special Dark Kisses would contain about 2.2mg of caffeine per Kiss. Caffeine can vary depending on quality of Cacao and where it was sourced.